SimplyHome has been named one of OUTSIDE’s Best Places to Work of 2016. Each year, OUTSIDE recognizes the top 100 companies in the United States that help their employees strike the ideal balance between work and play. These companies encourage employees to lead an active lifestyle, are eco-conscious and prioritize giving back to the community. SimplyHome ranked #48 on the list. Other organizations on the list included New Belgium Brewing, Toad&Co., Smartwool, and Big Agnes. A dog park to accompany a dog-friendly office, company breakfasts, ping pong tournaments, and birthday celebrations sometimes involving a piñata, are only a few of the perks that come with being part of the SimplyHome team. But, what really excites us about working at SimplyHome is learning to understand what it means to be person-centered - to listen to the goals and desires of people that are often written off because of their disabilities. As people, we all crave the same things: independence in our daily lives, deep connections with other people, and the opportunity to work towards our goals. We recognize that quality of life does not have to be compromised because of someone's age or disability. Many individuals living with a developmental disability or wishing to age in place have the ability to live independently in their homes - if given the proper support. In addition, rising costs of health care and the economic climate impact quality of life. We develop assistive technology to empower individuals to have the freedom of choice - the choice on how they want to live and where they want to live. Our technology proactively alerts loved ones and caregivers of changes in behavioral patterns via text message, email or phone call alerts. Whether it’s grandma turning the stove on in the middle of the night, grandpa forgetting to close the front door or your son leaving his bed at an unusual hour, family and care staff can be instantly notified. Q: What separates SimplyHome from other companies? A: Our people make us uniquely different. As a technology company, outsiders think it's all the cool, shiny objects that separates us from others. The reality is the technology we use changes all the time...it's the people who make the difference. Q: SimplyHome hires people who live a very passionate life. What do you see as the relationship between passionate employees and excellent work? A: When a person has passion in their personal and professional lives, it creates vision and purpose to make the magic happen in every part of their day. One key interview question we ask every applicant is "What do you do outside of work"? We know everyone is uniquely different, but we want the common thread to be a zeal for life because it makes the most of every day. In short, we believe a genuine passion will lead to outcomes of excellence and a life filled with joy. Q: How does hiring passionate people contribute to the overall tone of the office? A: To make a difference you must have balance, joy and self-direction as a natural part of who you define yourself to be. The company's responsibility is to feed each person's desire to make a difference through supporting their compassion. We all benefit from being surrounded by people who connect the love of outdoors, community involvement and personal values with a focused passion to help others. I believe they go hand in hand. Essentially, the culmination of what we do and the outcomes we are honored to create every day, is better because of our people. 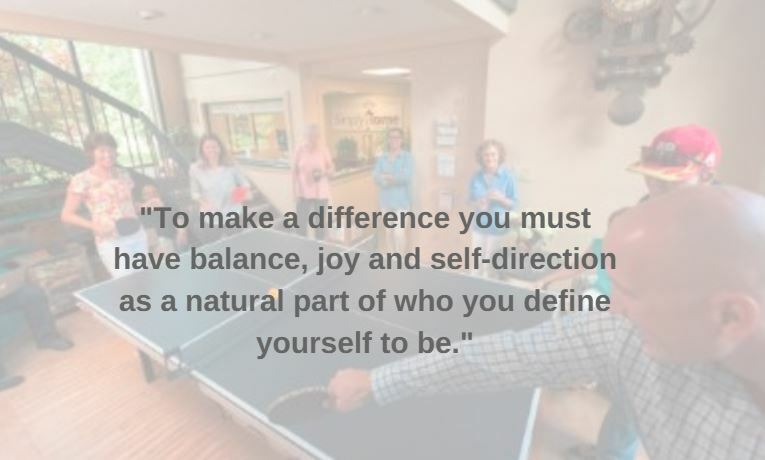 Q: How has being located in Asheville helped SimplyHome to thrive as a company? A: I believe the place and people you surround yourself with makes a huge difference in the pure joy each of us experiences! Being a part of this beautiful area replenishes the energy needed to be the best person you can be. An afternoon hike on the Mountains-to-Sea trail, a bike ride along the Parkway, a stroll through the Arboretum or kayaking through a national forest, topped off by your favorite local brew will replenish your soul like little else. Being in Asheville allows the opportunity to connect like-minded people into a cohesive team, while affording all of us the opportunity to call this beautiful place home. Above all, SimplyHome believes in doing the right thing for those we are serving, ourselves and our community. Want to explore how technology can empower independence? Check out our Facebook Page for up-to-date news! For any questions, contact SimplyHome at 877.684.3581 or email info@simply-home.com.